In a pot bring to boil water, salt and lemon juice. Rinse the shrimps and boil them for 2 minutes, keeping track of the time from the moment when the water returns to boil after adding them in the pot. The cooked shrimps should be bright pink. Trying not to damage the shrimps remove them from the pot and transfer in iced water. Help yourself with tongs or a ladle. Let them cool down for 2 minutes. Peel the shrimps (leaving the tail-on) and drain them very well. In a large pot, heat enough water to cook the pasta. When boiling, add salt, the spaghetti and cook until al dente. In the meantime, chop the garlic, wash and cut the mushrooms. Thaw the shrimps and bring them to room temperature if frozen. In a large skillet, saute the garlic in olive oil until lightly brown. Add the mushrooms and stir fry for 1-2 minutes at high heat. Stir frequently. 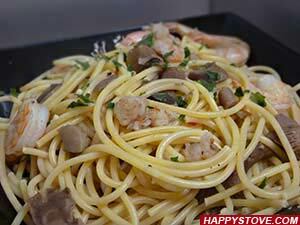 Transfer the shrimps in the pan and saute with the garlic and the mushrooms to allow the flavors to mix. Adjust with salt and pepper as desired. When the spaghetti are fully cooked, drain and transfer them into the skillet. Saute quickly for 30 seconds at high heat with the sauce, mixing very well. Transfer on plates and sprinkle with chopped Italian Parsley before serving. To spice up this recipe you can add some crushed red peppers with the garlic and the onions.